"No more talking, shoot," says Nachman Shai, a former IDF general who is currently a dovish Member of Knesset. A respected Ph.D. in political science and communications, Shai was the IDF spokesman during the Gulf War of 1991. When Hamas broke the latest ceasefire on August 19, it was the last straw for most Israelis. Obviously, Israelis aren't eager to continue fighting in Gaza, endangering Israeli soldiers and putting Gaza's civilian population at risk. But Hamas' fat cat leaders, ensconced in Qatar and exemplified by Chairman Khaled Meshal, have no compunction about continuing the fight to the last Palestinian - as long as they aren't personally endangered. There have been lots of headlines lately about the newest Al Qaeda offshoot, Islamic State (known as IS, ISIS, ISIL, etc.). Every Westerner recognizes IS as a horrible organization that stops at nothing to achieve its aims, specializing in hideous beheadings of its rivals and even journalists. Hamas, an organization with many similarities to IS, doesn't face withering media opposition, like IS does. Why is Hamas given the benefit of the doubt by world leaders and the media? The reason is because Hamas fights Israel, the Jew among nations. Hamas, like IS, is a Muslim organization whose agenda is to bring about a Caliphate that will erase current national boundaries and implement strict Muslim law (Sharia). "As for the objectives: They [Islamic Resistance Movement] are the fighting against the false, defeating it and vanquishing it so that justice could prevail, homelands be retrieved and from its mosques would the voice of the muezzin emerge declaring the establishment of the state of Islam, so that people and things would return each to their right places and Allah is our helper. "As the Islamic Resistance Movement paves its way, it will back the oppressed and support the wronged with all its might. It will spare no effort to bring about justice and defeat injustice, in word and deed, in this place [Palestine] and everywhere it can reach and have influence therein." The United States sees the danger from IS and has now entered the fight against it. Some other Western nations will join the fight. The rest will draw a sigh of relief that someone else is fighting their enemy. Yet, the West doesn't see that Israel is at the forefront of the fight against Jihadism (Muslim holy war against disbelievers). Instead, Israel is pilloried for defending itself against thousands of rockets fired on its civilians and destroying tunnels whose aim is to allow terrorists to slaughter sleeping Israeli civilians! Answer for yourself the above questions from Amos Oz. Who is responsible for the many casualties the Arabs are suffering in Gaza? (Remember that about half of the casualties are Hamas members, not civilians as is being reported.) If the toddler held by the terrorist shooting at you is killed, per Amos Oz's example, is the toddler's death your fault or the terrorist's? Obviously Hamas, the aggressor shooting thousands of missiles targeting Israeli civilians, invites massive retaliation, for which it is responsible. Of course, the Hamas leaders understand this. More than that, it is their strategy to pile up as many Arab casualties as possible, the better to gain the sympathy of the world against the "Israeli-Nazis." 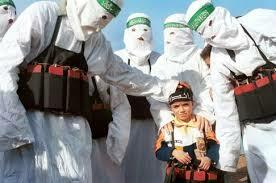 However, even some Arabs have realized that Hamas is a bigger enemy to them than the Jewish State. President Abdel Fattah al-Sisi, head of Egypt, the leading Arab nation, backs Israel against Hamas and its patron Qatar. Other Arab leaders have joined him, mostly covertly. Israel doesn't ask the world to fight its battles for it. Israel is not Iraq, which is incapable of defending itself against Jihadism. Israel only asks that the West let Israel fight and win against its antagonists, in this case, Hamas. In fact, Hamas is making the choice between it and Hamas easy for America and other Western countries, unless they choose to be myopic. Hamas breaks every ceasefire with Israel and makes demands that are incapable of being filled by Israel, if it wishes to remain the Jewish State. 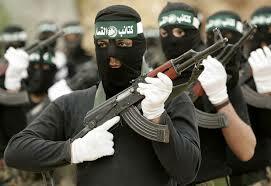 Hamas positively knows that more Arabs in Gaza will die because of Hamas' intransigence. (No problem, at least if you are hiding in a fortified bunker under a hospital or living it up in the pleasure palaces of Qatar.) Hamas' grand strategy of sacrificing Arabs to destroy Israel is so blatant that only those who are willfully blind can ignore it. So, now is the time for Israel's leaders to stop talking and to continue shooting. Don't waste time dickering over whether there should be an airport or seaport in Gaza, run by terrorists. Don't allow Hamas to again regroup by the decoy of ceasefires, which have no benefit for Israel. The soldiers of the IDF want to defeat their implacable enemy and the citizens of Israel want the IDF to do the necessary work, even while knowing that Israeli sons will pay the price. Without a victory over Hamas, the southern regions of the small state of Israel will be depopulated. How much can people stand, living in a place that is continually attacked? This must not be allowed! May our leaders take their strength from the people of Israel, and exhibit the will that is necessary to reduce Hamas to an empty shell. And let the Western leaders remove the scales from their eyes and recognize that global Jihadists are a danger to them, regardless of how far they live from the Middle East. In short, Let Israel Win.